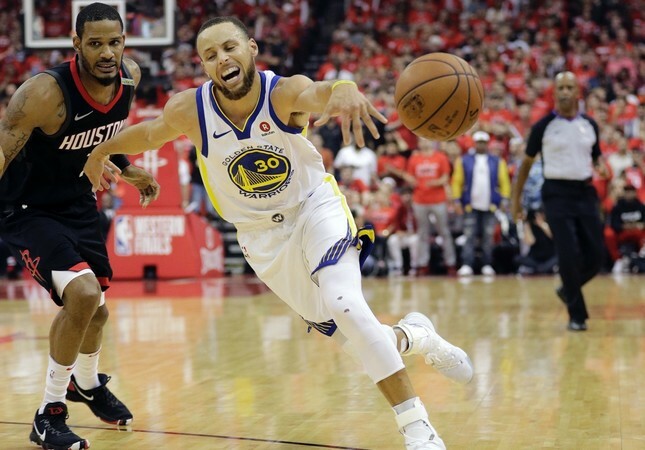 Golden State Warriors guard Stephen Curry (R) drives around Houston Rockets forward Trevor Ariza (1) during Game 7 of the NBA Western Conference finals, May 28. Stephen Curry and Golden State turned all those Houston bricks into a road back to the NBA Finals. Needing not only all their firepower but also 27 straight misses by the Rockets during an epic cold streak from 3-point range, the Warriors rallied to keep alive their hopes for a repeat. Kevin Durant scored 34 points, Curry sparked another third-quarter turnaround, and the Warriors earned a fourth straight trip to the NBA Finals by beating the Rockets 101-92 in Game 7 of the Western Conference finals on Monday night. The defending champions trailed by as many as 15 in the first half after falling behind 17 in Game 6. "We know we can make an 11-point lead evaporate with two minutes of good basketball," Klay Thompson said. Curry, who finished with 27 points, scored 14 of Golden State's 33 points in the third quarter as Houston's shooting didn't just go cold, it froze. The Rockets missed all 14 3-point attempts in that quarter as part of a 1-for-21 second half from long range. Curry said someone asked him after the victory if it's still special to get to the finals when it's the fourth time in a row. "Yes," he said, "because it's really hard."